Mothership Wit - Organic Wheat Beer Brewed with Spices. If you haven't tried this, you are seriously missing out my friend! Ah, I just love summer time! I love the intense heat of the days and the way it lingers around in the evening. I just can't get enough of it! I am a sun goddess at her best! Long drives in the jeep with the top off, sitting on the back porch with a 6-pack of yummy goodness, bbq's with friends, pool time... I will find any way to worship the sun. Our favorite summer time meal is something we can throw together quick and easy and doesn't heat up the kitchen! A quick stop at the store for whatever we can throw on the grill and sit back and relax. Tonight's choice was chicken, corn on the cob, pita bread and a 6-pack of Hazed and Infused. Mama I'm coming home! Now that song is in your head, right? I don't know why I thought of that song when I was preparing this meal. It just felt right is all. Don't judge! Sprinkle with ground Chipotle Chili, ground coriander, and cumin. Top with a slab or two of butter. Wrap in foil and grill! My genius sister-in-law, Carrie brought over some pita bread on Saturday for our impromptu BBQ/Rock Band rock out night. She advised we brush it with olive oil and throw it on the grill. Oh. My. Yummy! I had to have some again tonight! No one can rock out White Wedding like me and Care Bear Love! Please be advised that grape vodka and 7-Up on a hot evening tastes like kool-aid. The more you drink the better I sound at singing! Drink up! 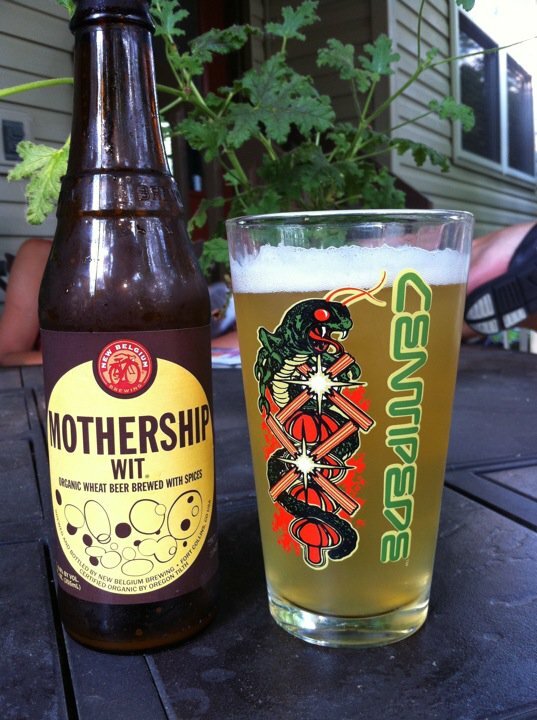 I have never heard of Mothership Wit Organic Wheat Beer Brewed with Spices. Food looks great! Looks fab! I am going to try the pita bread. Thanks for sharing. I love the names of those beers, especially Hazed and Infused. This looks like a really healthy and delicious bbq. That pita is a great idea and the corn sounds delish. Bon appetite! I'm going to make corns your way next time! Sounds delicious!! Grilled pita bread, cold beer, and that corn - perfect night!! I will be trying this corn for sure. I love corn, and always want to spice it up! We still have a few weeks before summer really arrives here in Seattle so I will be living vicariously through your posts until then! Can't wait to get some corn on the grill! You are making me want to go outside and fire up the grill. I just wish it wasn't only 60 degrees out there. That is how I make corn, too! I love it!